In September of 2009 as Windows 7 was nearing release candidate status, we conducted some initial tests with the latest available Windows 7 build. Products tested and results to date have been very similar to the ones we ran with Vista (see Vista compatibility). Applications work as expected using normal installation procedures including Advanced Accounting 5.1, Advanced Accounting 6.1 and the recently released Advanced Accounting 7i. Corresponding releases of TAS Professional and TAS Premier also appear to work as expected. Windows 7 issues will be similar to those identifed as Vista issues in our Vista compatibility tech support memo. Windows 7 does seem to exhibit some general flakiness with respect to networking including unexplained connection loss and latency in recognizing mapped drives. It is also sluggish and harder/slower to support remotely than say XP Pro. 16-bit programs such as Advanced Accounting 5.1 and applications written to work and run on the TAS 5.1 era executables will continue to function with 32-bit operating systems (and they work fine with 64-bit processors). 16-bit programs run under 64-bit operating systems whether XP Pro, Vista or Windows 7 will not work as expected out-of-the-box. As we originally expected, however, the Windows Virtual PC continues to allow Advanced Accounting 5.1 to run (as well as other 5.1 version programs and no doubt prior versions as well - we are not planning to specifically test these older versions however; to the extent the 5.1 version continues to work we will continue to support it). To use the Windows Virtual PC, the Windows 7 Professional or higher level operating system is required. End users have experienced success running both Advanced Accounting 5.1 and TAS 5.1 using the Windows Virtual PC (which requires a separate download from Microsoft). Third party accounts report success redirecting output using standard NET USE commands as well. This means that 5.1 users will continue to be able to run their legacy programs under now commonly provided 64-bit operating systems. Adv 5.0/5.1 and TAS 5.0/5.1 users will need to continue to make sure that users have not just read rights but also "write" rights to the various files in shared folder where TPC50.EXE is launched. The familiar TAS50.OVL was not found in your default path message will otherwise be received. Each new MS operating system release seems to make this more and more difficult than the prior one. For developers that prefer to provide help via the Win HLP format, Microsoft indicates that a WinHlp32.exe will be available. Pervasive 9.x through 11.x workgroup engines have been tested and work as expected as have client-server engines. They need to be configured similar to Vista and it takes some additional steps to install. See our Vista compatibility memo for additional information. Users migrating to Server 2008 however will need to use the Pervasive 10 or 11 level engines. Pervasive 10 and now the newer 11 is also the best choice for Vista/Windows 7. No new issues with respect to SBS 2011 are known. Legacy Btrieve 6.15 and Btrieve 5.10a both appear to work as expected. As in other recent MS operating system releases, local users will no doubt need power user or higher administrative privileges to be able to effectively run with these legacy releases. Using the latest version of Pervasive, privileges can be then adjusted as desired. International users have reported issues with Windows 7 and date formats such as dd/MM/yyyy or dd MMMM yyyy generally (i.e. with other Windows applications). 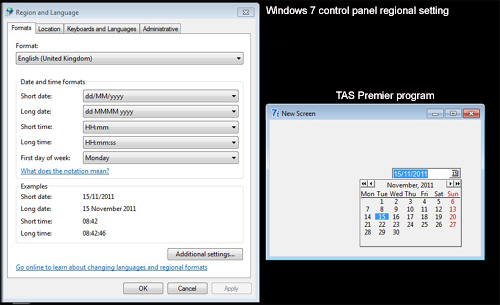 TAS Premier 7i's date formatting will normally change based on the local PC's regional date settings. So, with a setting of English (United Kingdom), date formatting in TAS Premier date objects and in conjunction with other date related commands and functions will follow that setting. Some international builds of MS Windows 7 however seem to either not properly apply this change or retain an English (United States) setting out of the box despite defaulting to something else. One reported workaround is to change the setting to English (Canadian), apply, and then change the setting back to English (United Kingdom) and apply. TAS Premier 7i rel. 5 (released on 10/31/2011) has been tested on Windows 7, and there are no known issues.